A bite-sized pixel-art underwater Metroidvania starring a squid. 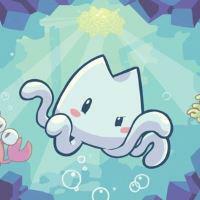 Swim to explore your environment, get new abilities, and do favors for sea urchins. It’s a solid foundation that feels more like a proof of concept than a finished game, clocking in at about an hour and leaving most of its ideas undeveloped. The controls are unusual but easy to pick up - you normally sink downward, but tapping a button will swim upward - hold left or right to swim diagonally, but you can’t swim down. Two upgrades add new abilities but don’t change this core which you must apply to survive momentum-focused platforming challenges and enemy encounters. Combat (once you have the required upgrade) is like a reverse Super Mario Bros. with you swimming into enemies from below instead of jumping onto them from above. This is well-tuned and responsive, and as a result the moment-to-moment gameplay is smooth whether you’re avoiding spikes or attacking crabs. However, it barely has a chance to shine before it’s over, and a lot of what’s built on that foundation feels unpolished. The story asks some intriguing questions but answers basically none of them. There’s a simple experience and leveling system, but it barely matters and feels tacked on. There is no map in the PC version, and the one in the 3DS version is barebones, which is unfortunate as you have to do a lot of backtracking to find the next event flag or place that was previously blocked off but is now explorable. For some reason, there’s a room that seems to exist mainly to kill the player - entering it without a specific upgrade, which you can’t really figure out beforehand, is a one-way door to death and restarting from your last save. Death in general is weirdly punishing, wiping out all progress since the last manual save which can only be done at a handful of save points. For me, this created lasting tension that made it hard to enjoy the otherwise chill and charming gameplay on offer. Ikachan ’s movement feels good, and could serve as the foundation of a solid game. But Ikachan is too insubstantial to be that game. Instead, it just proves such a game could exist.